The valley of Spiti derives its name from the Spiti River, which rises just below the 16,000 ft high Kunzum Pass. After flowing for about 60 miles, it joins the Sutlej River near the village of Namgiya in Kinnaur district. En route it is fed several streams - Pin Cholmo, Gyundi, Rahtang, Ulah, Lungse, Mane, Surahi, Hanze, Tagling, Thumpa Lumpa, Kaza, Lingti, Parechu and Tabo. Deep inside the inner folds of the Himalays, behind the greater Himalayan ranges lies the valley of Spiti. The sheer starkness of its beauty with its dramatic rock shapes and colours and its distinct cultural identity gives it a unique character that makes it stand apart from most of the other valleys of the Himalayas. Huge mountains rise to very high elevations on either side of the Spiti River and its numerous tributaries. The valley has largely been influenced by the action of ancient glaciers. The river and its tributaries have deposited almost barren river terraces. The river attains peak discharge in late summers when snow on the mountains melts and it occasionally freezes in winter. 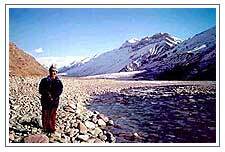 The main settlements that have come up along the Spiti River and its tributaries are Hansi and Dhankar Gompa.